French braids are an elegant hair style with endless possibilities for unique and creative variations. While most people are familiar with the techniques for traditional hair braiding, French plaits often intimidate even experienced braiders. With care and patience, this braiding method is easy and can lead to beautiful styles. • Take a triangular section in the bangs area and divide the section into three equal parts. • Begin with one of the outer sections and cross over the middle section grasping the hair into the opposite hand while pulling taut. • Take the remaining outside section along with roughly a 1/2″ section of loose hair from the hairline and cross both over the middle and to the opposite side. • Holding the section you just completed, grab another 1/2″ section of hair from the opposite side and repeat until finished. • When complete, secure your braid with an elastic of your choice and spritz with hairspray. That’s all there is to creating French braids, but how you vary your technique can create a wide range of different styles. Adding greater amounts of hair, for example, will create a thicker, chunkier braid, while using slender, delicate amounts of hair will result in a thin, elegant braid. Two braids can be created on either side of the head, and they can be woven together in the tail to create a single braid. To add some variation to this classic style, the options are endless. Consider working sections up at an angle to add some lift to your face or braid straight back for a sleeker look. For finer hair, working with thicker sections may be easier and will create a more substantial braid. Larger width sections will also add variation to the braids as will adorning them with hair accessories, including ribbons, bows barrettes and decorative bobby pins or barrettes that will also help secure flyaways. Create a unique updo style! To create a more youthful look, why not try your hand at creating two braids? Simply part hair down the middle and divide hair into two sections. Starting in the bangs area on one side of the head, create triangle sections and divide hair into three parts. 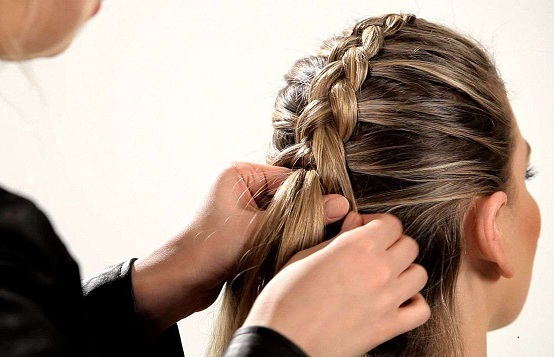 Follow the basic braiding technique and soon you’ll be flaunting a feminine and girly style. This is also a great look for youn girls or teens who need to keep their hair out of the way but still want to sport a stylish ‘do. • Using leave-in conditioner to reduce tangles. 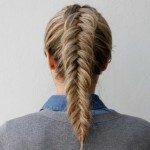 • Avoid pulling hair too tight – a looser braid will rest more smoothly against the head. • Add styling gel or other manageability productsto reduce frizz. • Hold your hands further from your head to create a softer look. • Braid hair while it is slightly damp for greater control and a smoother result. 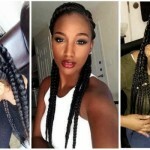 • French plaits work best with either medium or long hair, and practice makes perfect when creating a gorgeous style. Experiment with adding different amounts of hair, increasing or reducing the tension, and widening or thinning the braid base. Eventually, your fingers will develop a feel for how to form the perfect braid, and you will be able to design advanced styles and elegant looks. Braids are a versatile hair style, perfect for women of all ages. Young girls can wear a French style regardless of what activities they’re engaged in, and their hair will stay neat and secure. Cheerleaders and other teen girls appreciate the wide range of variations they can create with French variations, and many adult women prefer the style for its practicality while still presenting an elegant and sophisticated appearance. 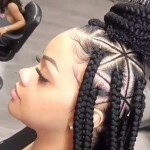 Cornrows and microbraids are a specific type of intricate French style, and many types of braids can be easily accessorized with pins, ponytail holders, clips, and other creative accents. A simple updo style can be created by turning the tail of the braid beneath the plait and pinning it out of sight, though this works best with shorter braids. Braid ends can also be wrapped around the individual’s head in a crown or horseshoe arrangement, or twisted into compact buns. A more complex styling technique is to create the braid by drawing each strand beneath the overall style rather than using an overhand weaving method. 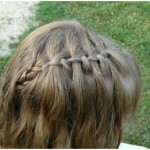 This will create a smoother style against the head while forcing the braid to stand out more distinctly. Regardless of the type of French braids you create, they can be arranged into elegant prom or wedding styles with just a few accents and accessories. French style braiding is an elegant and exotic alternative to traditional braids with extensive possibilities for styling and personalization. With care and practice, anyone can learn techniques to create fabulous French braids.